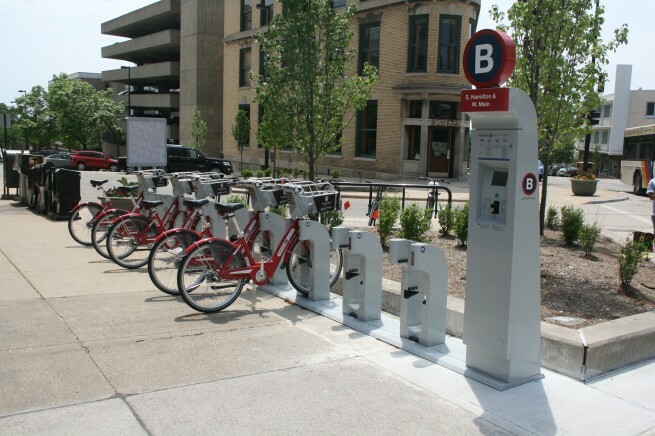 Bike-sharing is coming to Milwaukee! Bike-sharing is coming to Milwaukee, or at least to Discovery World for a limited time. On Thursday June 23rd, from 11am-2pm, B-Cycle, a partnership between Humana, Trek Bicycle and Crispin Porter + Bogusky, will be bringing their 5-bike, demonstration station to Discovery World. Representatives of B-Cycle will give a presentation, allow people to test ride the B-Cycle bikes, and use an operational docking station. B-Cycle has rolled out bike-sharing in Denver, Chicago, Des Moines, San Antonio, Kailua, Boulder, Madison, Omaha and Madison. Bike-sharing can be an effective method of alternative transportation and can act as a pedestrian accelerator allowing the system to replace short automobile trips with bike rides reducing congestion and parking needs. For example, a system here in Milwaukee would allow users to check out a bicycle to go to the grocery store, visit the Milwaukee Art Museum, or go to dinner on Milwaukee Street without getting in to an automobile. Milwaukee’s neighboring cities of Minneapolis, Chicago, and Madison have recently implemented bike-sharing systems. Just recently Madison installed a starter B-Cycle system of 300 bicycles. Chicago started with a small system of 100 bicycles and six stations, but continues to expand the system. And even very cold weather Minneapolis implemented a bike-sharing system. A system that started with 65 stations with 700 bicycles, and due to high utilization added an additional 40 stations in short order. Minneapolis, Chicago, and Madison show that even a cold weather city can implement a bike-sharing system, is Milwaukee next? I wrote to your guys about Bixi bikes in Montreal. This is such a beautifully simple system that it can be hard to believe. If these guys do it the way Bixi does, there will be a short period of 30 minutes or so that is free to subscribers. This promotes fast turn over and encourages short trips, yet allows for longer trips if necessary. If I pick up my bike at the corner of Downer and Bellview, I can probably get downtown in less than 30 minutes. Dropping off the bike not only prevents me from occurring fee’s while I conduct my business at , let’s say, City Hall, it makes the bike available for another customer. Just as a sort of correction to your list of bike share programs, I’d add that the NiceRide system in Minneapolis is beginning its expansion across the river to St. Paul, in the next couple of weeks. @Nick Thanks for the update! Growing faster than I can keep track apparently. @Jeff Yes the system is very similar.